The Infant Jesus of Prague is one of the oldest statues of the child Jesus, and people from all over the world come to visit it. If you ever have the chance to visit Prague, I recommend you see the statue of the Infant Jesus of Prague, at the Church of Our Lady of Victorious. It is really something special. The cult of the Prague child Jesus began in the in the Baroque Period in Spain. An unknown artist created it for a convent between Cordoba and Seville. Dona Isabel Manrique de Lara, a noblewoman acquired the statue from the convent as a wedding gift to her daughter Dona Maria Manrique de Lara, and in turn she gave it as a wedding gift to their daughter, Polyxena. After herdeath, Polyxena donated the statue to the Monastery of the Teresian Carmelites, which was next to the Church of Our Lady Victorious in Prague. In 1631, the Swedes and the Germans invaded Prague. The Teresian Monastery was plundered without mercy. The Church of our Lady Victorious still stood in all its glory. Everything that could be carried or carted away had been taken. The Church was a shell. The statue of the Christ Child Jesus was denuded and thrown out with the debris behind the High Altar. A monk, Father Cyril found the Prague child when he returned from Germany to Prague to the abandoned Church of Our Lady Victorious. The statue was badly damaged. Both of its arms had been viciously torn from its sockets. Miraculously there was not a scratch on its exquisite face. The Prague aristocracy gave Father Cyril the money to repair and restore the broken arms. It took a long time to find the right craftsmen for the daunting task. The Christ Child Jesus thus became the object of worship. It too was not only a survivor but also a Protector because his house the Church of Our Lady Victorious was intact. It did not suffer the fate of many churches, which were completely destroyed, burnt and razed to the ground. 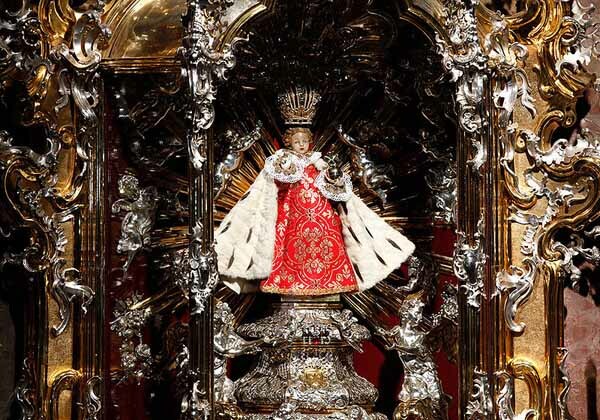 The Bishop of Prague crowned the Infant Jesus with a gold, diamond and pearl crown fit for the King of Kings. It was a gift from Prince Bernard Ignatz von Martinich. At that time, silver and gold circlets were placed around the statue as signs of Thanksgiving for answered prayers, and for continued serenity and prosperity. In 1938 Bohemia-Moravia became a Protectorate of the Third Reich. It was also the first state to be run and governed entirely by the SS. General Reinhard Heydrich, General Heydrich’s mother Elizabeth had remained a practicing Catholic and was fond of the Church of Our Lady Victorious because she had always nurtured a devotion to the Prague Child Jesus. He donated funds for a boys ‘choir, musical scores, and for repairs to the Baroque pipe organ. After General Heydrich’s assassination in 1942 the NSDAP seized all the properties of the Greek Orthodox Church for their part in the assassination. All its priests and clerics were executed and its Churches, schools and orphanages shut down. But all the Catholic Churches remained open. Our Lady Victorious was always singled out with favors and donations by the SS as a way of showing their respect for their fallen Leader. This continued until the Soviet troops entered Prague. Czechoslovakia as it was known then became a satellite country of the Soviet Empire. The godless Communists closed all the Churches and killed as many priests and nuns as they could. The religious men and women met in cemeteries, sewers and even in discotheques. Somehow they always managed to have a statue of the Prague Child Jesus hidden within their premises. They were never discovered. Discovery meant a gulag in Siberia or summary execution. They had faith in the Child Jesus. He was their Protector. On Christmas Eve some of them would enter the empty Church of Our Lady Victorious, which was never touched or used by the Party. And then they would pray to the Christ Child in darkness. After 1991, the Catholic Church rose from the dead as it were. Its priests came out into the light. Priests in their twenties and thirties proved that the Church had never died. The Christ Child Jesus is again the focus of veneration in Prague. People come from all corners of the world to pray and to donate funds or even clothes. The wax figure is 47 centimeters high. It is protected from harm by a silver casing that reaches all the way to its waist. The sculpture has a wooden core covered with fabric, which can be seen through the wax. The Infant Jesus is always dressed. The Prague Child Jesus wears a white undershirt over a white rocheta, and then he has a silk top with frills around the neck and hands. The fourth and fifth gown is much like a priest’s pluvial. He has two crowns on his head. The first dates from 1767. More than 70 opulent robes have been donated. The oldest and best preserved date from the 1700. One gown is studded with rubies, emeralds and pearls. It was a gift from the Empress Maria Theresa. Another one is made of pina and embroidered entirely in gold. The Infant has new dresses that are made of batik, obi, paper, jute, hemp, grass, straw and plastic. People all over the world continuously send dresses as gifts. The Prague Child Jesus usually holds various objects. He blesses with the right hand; in the left hand he holds a book, a bird, a cross or a cluster of grapes. This is a reference to the Eucharist. John 15: 1-11.